"Stuart really enjoys his job, he loves moving boats. So much so – he started his own boat transport business. His speciality is making the most difficult jobs appear effortless." We have Australia’s most modern boat transport equipment. Custom built specifically to transport an extensive range of vessels, flat racks and up to 40ft containers Australia wide. With 16 years experience Stuart Taylor is one boat transporter who is enthusiastic about moving boats. He has moved some of Australia’s most prestigious boats, from super maxi yachts such as “Wild Oats” to luxury cruisers, fishing and leisure boats, classic timber boats even work barges, right the way through to small rubber dinghys. His professionalism in transporting boats makes even the most difficult job seem effortless, and his reputation amongst those who he has moved boats for is highly regarded. 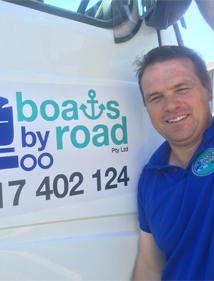 Boats By Road is a dedicated boat transport service, they believe being professional, reliable and cost effective are key business traits to ensure your boat is transported safely and on time.